From String Figures: A Study of Cat's-cradle in Many Lands by Caroline Furness Jayne. New York: Charles Scribner's Sons, 1906. We abhor the disorder of things. Disorder is, etymologically speaking, married to disease. Disorder is dis-ease. Disorder is also a confusion, an absence, a violation, a disturbance of mind or body. Destruction, rot, madness and death lurk at disorder’s edge. To defend ourselves against the immense entropic power of disorder we invent ways of organizing the world around us so that we may create an ordered and intelligible cosmos out of chaos. These ordering systems — whether they are called worldview, belief system, paradigm, Weltanschauung, episteme, ideology or science — are fundamental to our grand culture-building exercises; they are the bones of man-made worlds. These ambiguities, redundancies and deficiencies [of Wilkins’ analytical language] recall those attributed by doctor Franz Kuhn to a certain Chinese encyclopedia entitled the ‘Celestial Emporium of Benevolent Knowledge’. In its distant pages it is written that animals are divided into (a) those that belong to the emperor; (b) embalmed ones; (c) those that are trained; (d) suckling pigs; (e) mermaids; (f) fabulous ones; (g) stray dogs; (h) those that are included in this classification; (i) those that tremble as if they are mad; (j) innumerable ones; (k) those drawn with a very fine camel’s-hair brush; (l) etcetera; (m) those that have just broken the water pitcher; (n) those that from a distance resemble flies.1Borges, Jorge Luis. “John Wilkin’s Analytical Language (1942)” in Selected Non-Fictions. Eliot Weinberger, ed. New York: Penguin, 1999. 229-232. This is the passage that set Michel Foucault on the path to write The Order of Things. Borges’ essay traces not only the limits of language but the limits of human knowledge. The tragicomic kernel of the Celestial Emporium is an uncomfortable truth — as necessary and beloved as our ordering systems are, each one is congenitally flawed. Each one is imaginary, arbitrary, provisional, and incomplete. Each one is as absurd as another, and yet we can’t live without them. If there actually is such a thing as a unified and ordered universe, Borges writes, “then we must speculate on its purpose; we must speculate on the words, definitions, etymologies, and synonymies of God’s secret dictionary.”2Borges. 231. The Keeper, a recent exhibition at the New Museum, echoes Borges’ ancient encyclopedia. It is a collection of collections, a fragmentary encyclopedic catalog of projects, each one a speculation on God’s secret dictionary. But these speculations are presented outside of language, in the pre-linguistic, or, more accurately, in the ultra-linguistic realm of image and object, and so, necessarily, they do their philological work using what may seem to be queer methods. Even so, there are methodological and strategic similarities between them. Massimiliano Gioni, chief curator, organized his encyclopedia-exhibition around the notion of collecting, a universe-building exercise that, as he writes, is a Sisyphean and cyclical struggle between order and disorder; “to achieve the wholeness of a collection, one creates order and gives meaning to objects so that they form a universe of their own, which in turn becomes a mirror of the world in which these objects originated.”3Gioni, Massimiliano. “The Country of Last Things” in The Keeper, M. Gioni and N. Bell, eds. New York: New Museum, 2016. 10. But there are cracks in that mirror. Writing about his own bibliophilia, Gioni reveals the anxieties of cosmos-building; the pleasure he finds in surveying his library soon gives way to distress. He writes, “I’m suddenly reminded of the infinite gaps in my library and the hundreds and thousands of books I don’t have [. ..] And all at once the abyss of deficiency gapes open before me […] my library will never be complete and [despair] accompanies the most painful realization of all: that what I am trying to hide behind these books might be the thing I fear the most — my absolute, impenetrable ignorance.”4Gioni, 11. Cosmos-building is a hedge against our limits, a wager with finitude. And all the while, chaos nips at the collector’s heels. Arthur Bispo do Rosário. Dentaduras (Dentures). n.d.
Arthur Bispo do Rosário. Estrela de São João. n.d.
Arthur Bispo do Rosário. Manto da Apresentação (Presentation Mantle). n.d. The Keeper presents thousands upon thousands of individual things, each one a cosmos-vision made actual and exquisitely particular. 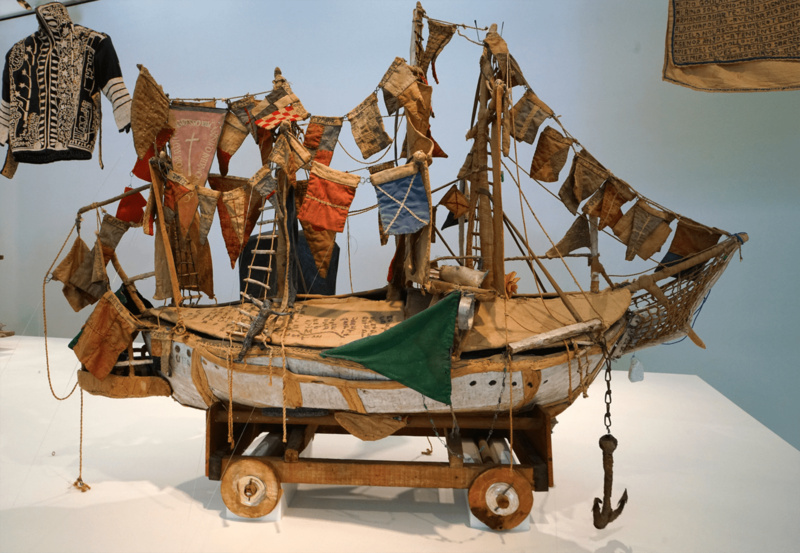 For example, Arthur Bispo do Rosário (1909/11-1989), an ex-sailor and diagnosed schizophrenic who spent much of his life in a psychiatric asylum in Brasil, created hundreds of embroidered tapestries, vestments, and constructions from junk and trash. He believed he was chosen by God to gather the salvagable world in advance of the Apocalypse. 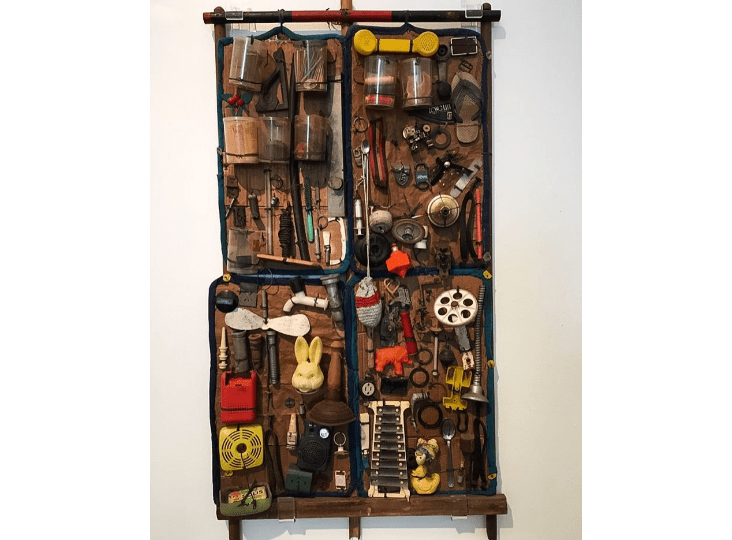 The ex-mariner filled his miniature arks with lists of names, gathered cast-off objects into scrap-wood iconostases, and fashioned a coat to wear on the occasion of meeting God. It seems we need a madman to remind us that every thing, and therefore every one, no matter how broken, dirty or deplorable, is, actually, redeemable. 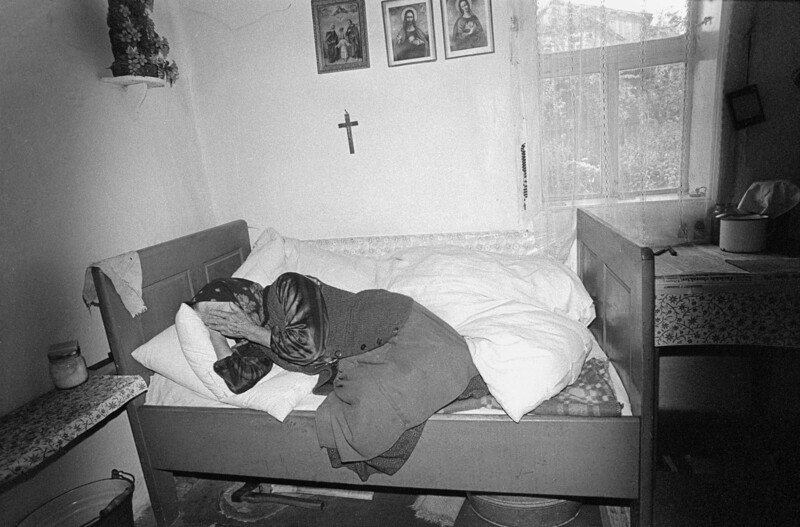 Bispo’s objects stand as mute testimony to the possibility of redemption, of actual hope and change. Zofia Rydet. Zapis socjologiczny (Sociological Record). c. 1978-1990. 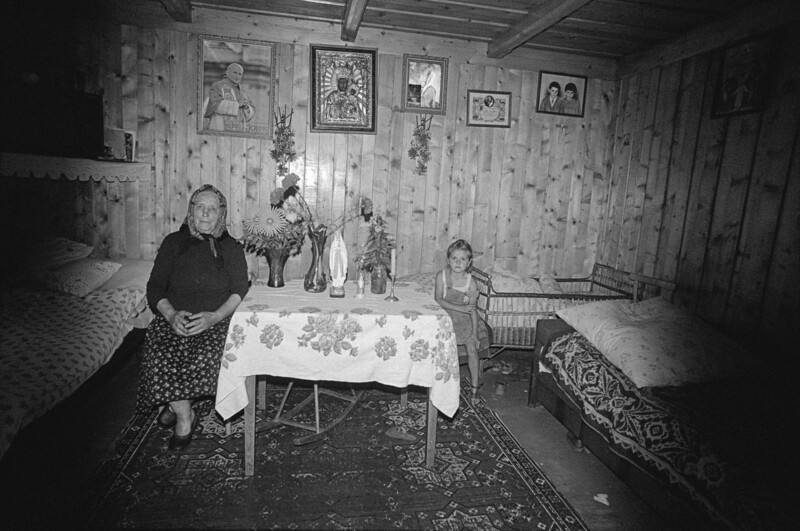 Zofia Rydet (1911-1997), the Polish photographer, decided at age 67 to document the interior of every household in Poland. 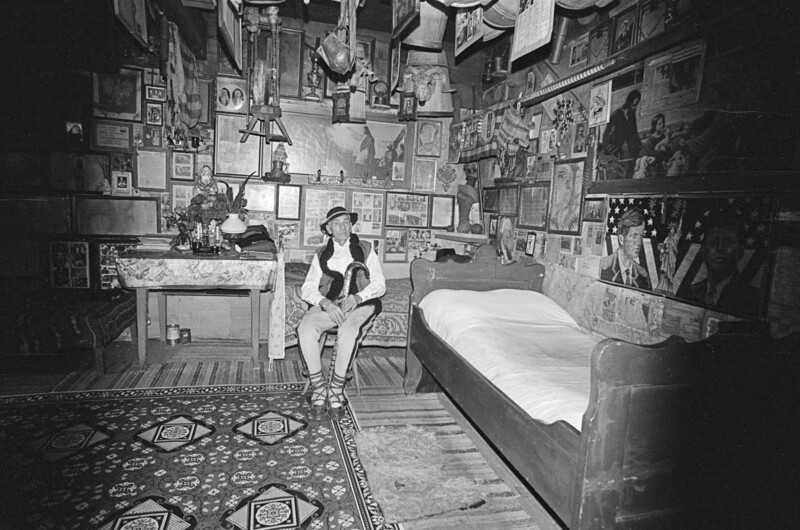 The black-and-white photographs show the inhabitants of their rooms surrounded, and part of, their own collections of objects and images. The incessant, unnatural wide-angle view and the incessant, unnatural light of a confrontational flash lend each photograph a familiar strangeness. They appear to be what they are: evidence photographs — proof of life, or proof of a specific type of disappearing highland life. A shadowed gloom threatens the image as the light of the flash falls off from the center of the image. A black void — true, primordial χἀος — lurks directly off-camera and gnaws at the edges of each picture.5I suspect it is the same black chaos that gnaws at the edges of Andrzej Stasiuk’s Tales of Galicia, a book of similar time and place as Rydet’s photographs. The photographer’s apparatus animates and creates this world, rescues it from the void, and does so over and over again, room by room, frame by frame. Rydet’s entire mesmerizing magnum opus is digitized and searchable online.6A lovely tote emblazoned with a quote by Zofia Rydet, “Dzień w kotórym nie fotografuję, uważam za stracony.” (A day in which I don’t photograph is a day I consider lost.) is available from the Fundacja Sztuk Wizualnych (Foundation for Visual Arts) here. 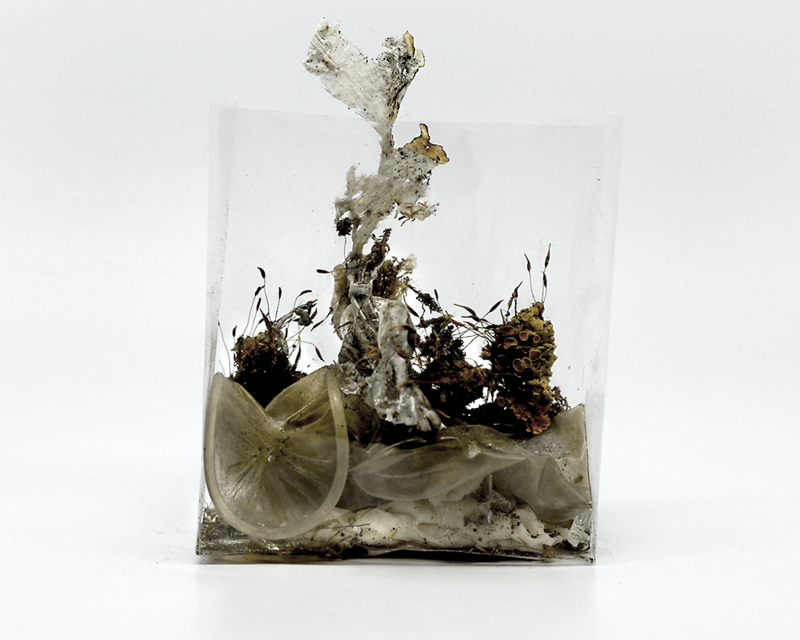 Yuji Agematsu’s cigarette-cellophane street-detritus vitrines. c. 1997-2016. 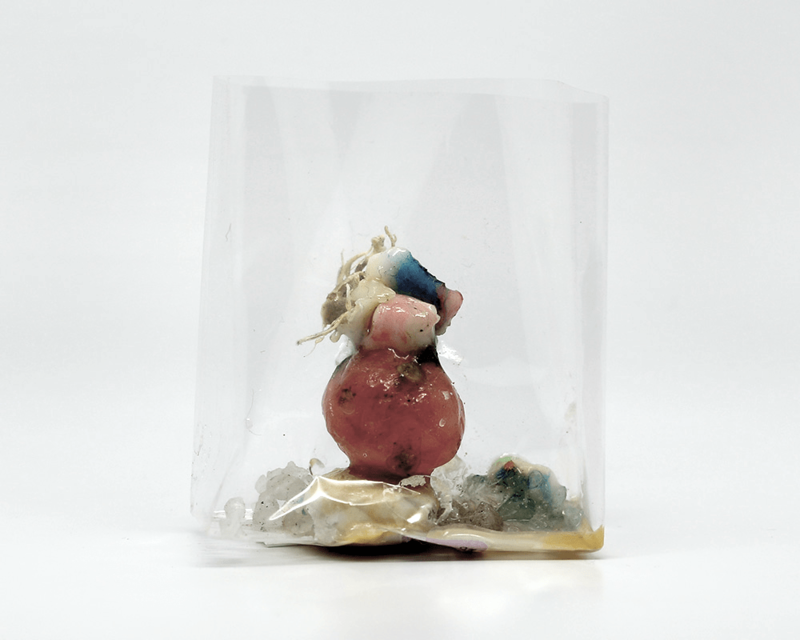 Since 1997, artist Yuji Agematsu (b. 1956) has, on daily walks in New York City, collected tiny bits of the detritus and effluvia the city continually sheds and coughs up onto its sidewalks. Agematsu’s Celestial Emporium is as fragmentary and strange as Borges’ — (a) an unfurled, secondhand condom, (b) half-licked lollipops, (c) chewed gum, (d) gobs of hair of unidentifiable provenance, (e) broken Q-tips, (f) wee bits of rotting vegetation, (g) mysterious goo, (h) the desiccated claw of a bird long dead, (i) a penny, (j) etcetera, (k) things a reasonable person would try to avoid encountering with a shod foot — comprise a catalog of materials that Agematsu uses to create worlds as intricate and harmonious as our own. Two braided ordering cycles seem to be at work in these worlds. First, of course, is the daily repetition of the artist’s collection ritual, a repetition entering its twentieth year. 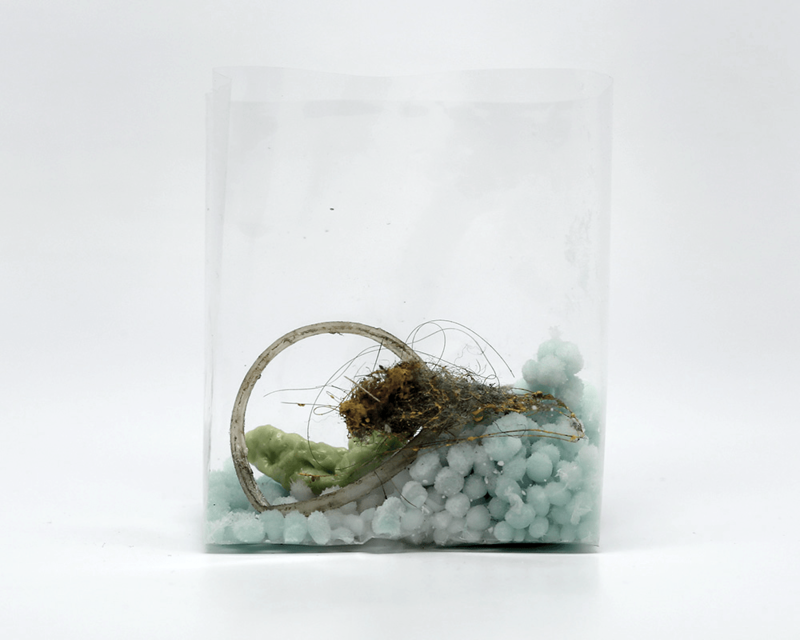 Second is the rhythm of the objects populating the cellophane-wrapped worlds. 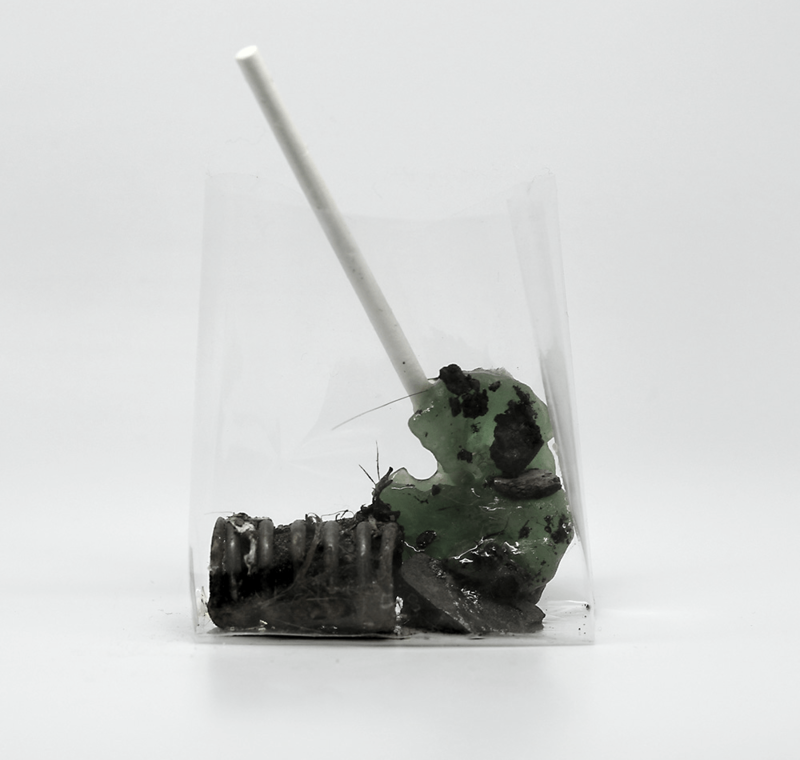 Each bit of detritus flourished at some point — the plants grew, the bird flew, the penny was shiny, the lollipop once enticed someone in its original cellophane wrap. Each one died or was lost or was discarded and left to decay. Each bit was then snatched up by the artist’s hand, and restored to a second life in another world. The tension produced by these twinned lifecycles — the daily repetition of the redemptive labor performed by the artist as he walks through time mirrored in the lifecycle of base earthly material — birth, efflorescence, death, decay, and rebirth, and re-efflorescence and (re-)decay — is a silent and invisible force that animates this universe, and ours. Korbinian Aigner. Grüner Bietgheimer. n.d.
Korbinian Aigner. Roter von Sich. n.d.
Korbinian Aigner. Straßdorfer Frauenbirne. n.d.
Korbinian Aigner. Späte Blutbirne. n.d.
Korbinian Aigner. 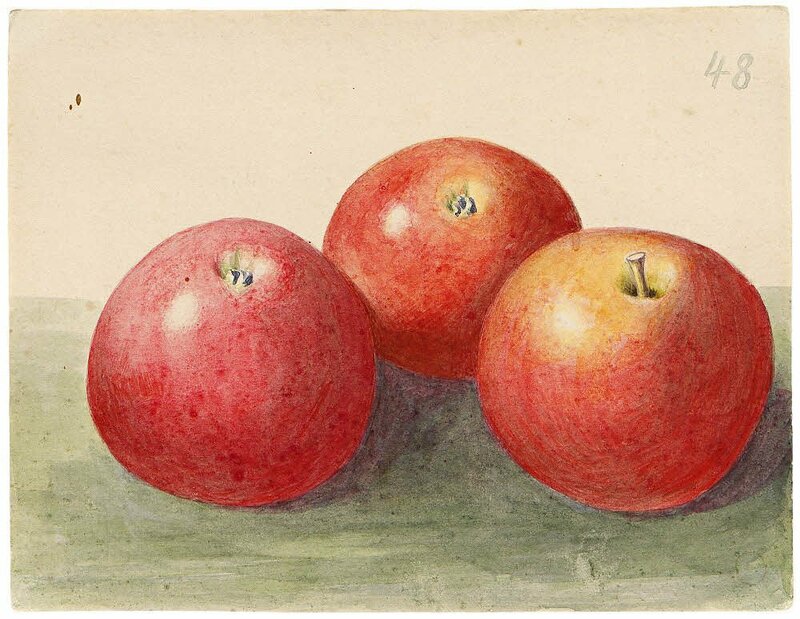 Adams Apfel. 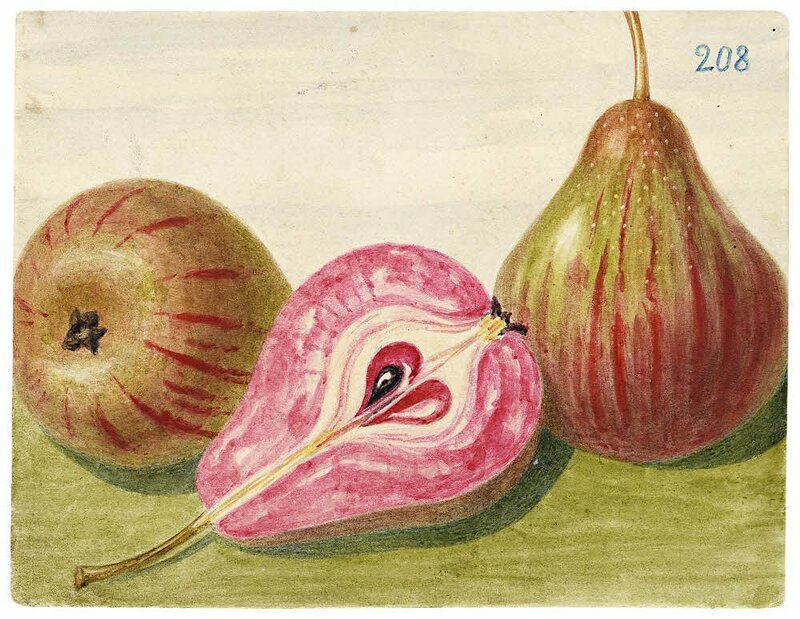 n.d.
Korbinian Aigner (1885-1966), also known as the Apfelpfarrer (Apple Pastor), was a German priest and pomologist. 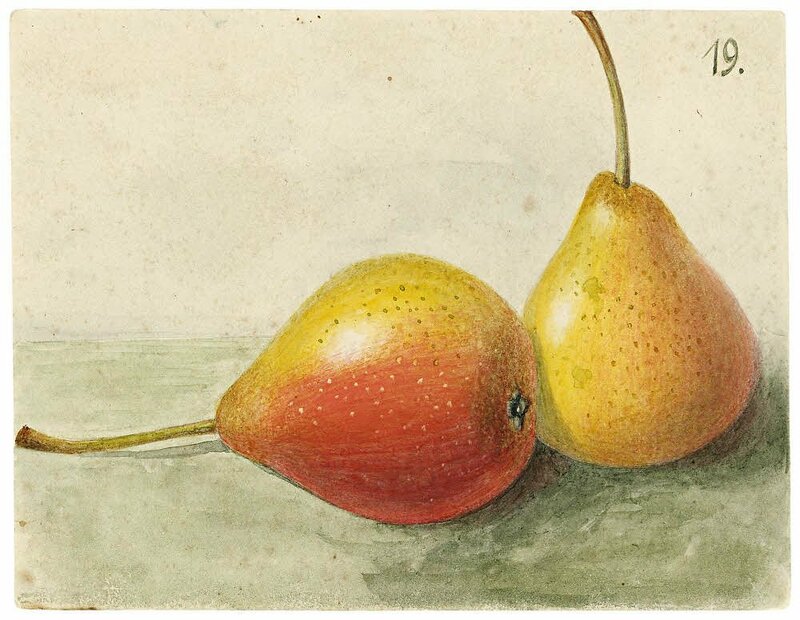 Over course of his life, he created over 900 paintings of apples and pears, one hundred of which are included in the exhibition. In the 1930s Aigner was an outspoken critic of the National Socialists and in 1939 was arrested and imprisoned in the concentration camp at Dachau. 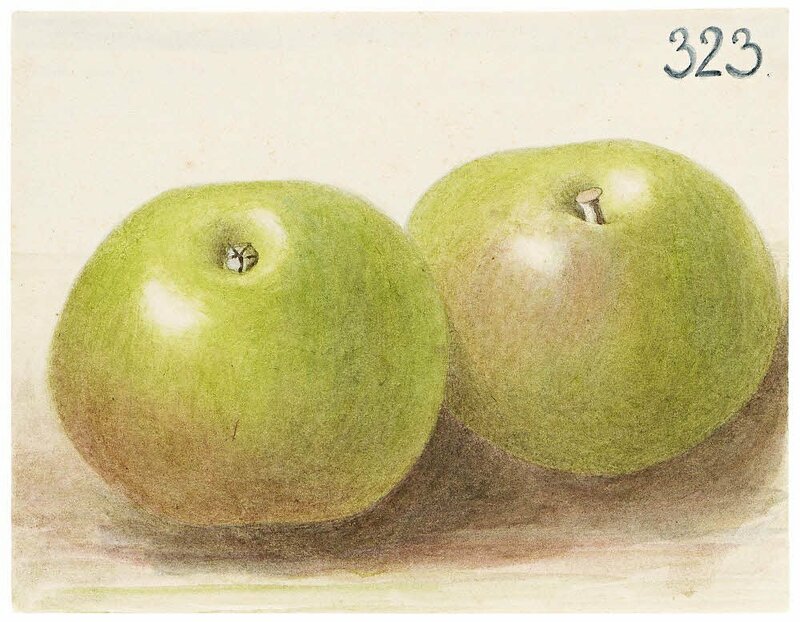 Throughout his imprisonment he was able to continue growing and developing apples, and he continued his cataloging practice. In 1945, he escaped and returned his parish, and farming, and painting, until his death in 1966. Like a specter, the Holocaust haunts The Keeper. It haunts Aigner’s fruit portraits, it materializes suddenly in MM’s drawings of daily life as a prisoner of Auschwitz, it bleeds into Hannelore Baron’s constructions, and it inserts itself into the artist’s biography and photographs of children lost in the centerpiece project of the exhibition, Ydessa Hendeles’ Partners (The Teddy Bear Project) 2002. Catastrophe of different species haunts the galleries as well — death and decomposition, hope and madness and the destruction of war — but the Holocaust seeps through the exhibition as a silent reminder that the absurdity of grand ordering systems is no trifling or benign or academic matter — it encompasses murder, slavery and genocide. Aigner’s work lives on in another way. 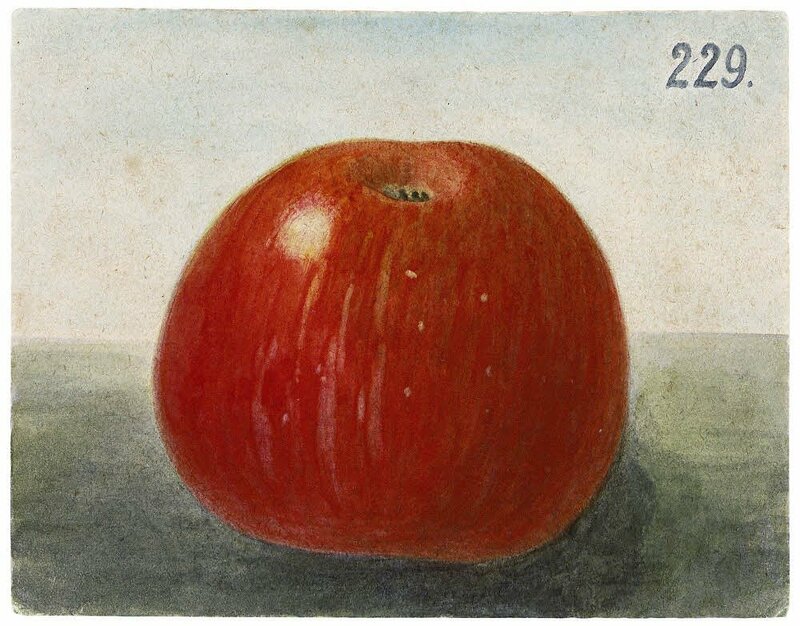 An apple variety developed by him, originally called KZ-3, but eventually renamed Korbiniansapfel in his honor, is still grown in Germany today. Saplings descended from a tree cultivated by Aigner at Dachau are available here. This selection of cosmos-building projects, a minuscule fraction of the work included in the exhibition, provides examples of the type of strategies The Keeper presents that cause difficulties for art historical interpretation and critical analysis. Brian Wallis, in his Artforum review of The Keeper, writes that through the exhibition Gioni argues for “a view of culture that is all-inclusive, encyclopedic, iconophilic, canon-busting, and defiantly outside the mainstream. His keepers defy the art-world apartheid of privileged radicalism, the exclusionary system of controlled selectivity, and feigned meritocracy that today so convincingly distorts our perceptions of creativity and its uses.”7 Wallis, Brian. “The Keeper.” Artforum. October, 2016. 271. Wallis describes the strategies that the (so-called) art-world uses in its grand culture-building project, and uses stark terms to do so: apartheid, privilege, exclusion and control. The unpleasant insight Wallis shares is that culture is created through exclusion and barriers, it is a reductive and distorting enterprise. Cosmos-building, on the other hand, as The Keeper abundantly illustrates, works in another way altogether. Cosmos-building in its many incarnations is endlessly inclusive, forever incomplete, always becoming.8The anxiety this strategic contrast creates in some culture-builders is evident in the language of pathology — “hoarding,” “mania,” “compulsion,” “creep factor,” “weirdo,” — that leaks into some reviews. Cosmos-building and culture-building work in contradictory ways and The Keeper puts this contradiction on institutional display.9Some 43 years ago, art historian Linda Nochlin describes the endless antagonism between the various incarnations of R/realisms and abstraction, as she sees it, in the art historical mode of high moralism. Indeed, the essay is entitled The Realist Criminal and the Abstract Law. In it, she describes the same contradictory forces at work in painting. She writes, “Whereas the nonrealist may work through distillation and exclusion, the realist mode implies enrichment and inclusion.” This is seen as R/realism’s fatal flaw, inclusion is a “lack of selectivity,” a sort of promiscuity which in turn leads to a existential “irrelevance.” She writes, “Irrelevance is indeed a prime feature of the intractable thereness of things as they are and as we experience them.” The Keeper presents an catalog of thousands of counterarguments to this fundamental art historical assumption — some objects, art history insists, because it has to, are better than others. 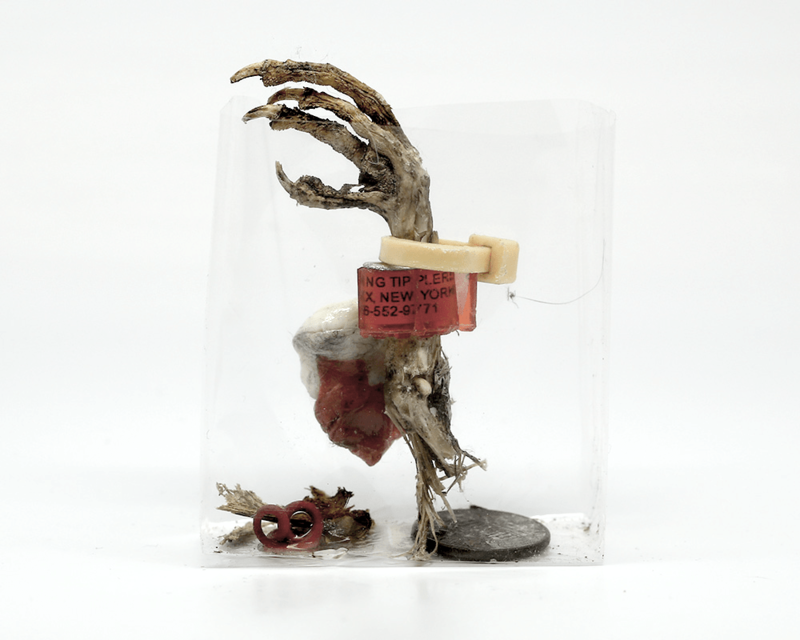 While many writers discussing the exhibition stop short at its lush catalog of idiosyncrasy, Jerry Saltz sees through the strangeness and describes the underlying intellectual and academic apparatus that makes The Keeper seem so odd. If we look to the grand culture-building discipline of art history to help us understand The Keeper or help us give it meaning, we would be left sorely disappointed. As Saltz describes, current art history is (still) so rigorously linear, teleological, and parochial that is not of much use outside of itself. According to current notions of art history, Saltz writes, “Artists and isms follow one another in a Biblical begetting based on progress toward a goal to higher stage […] The problem is that anyone who doesn’t fall into this timeline is out of luck.”10Saltz, Jerry. “The Tyranny of Art History in Contemporary Art.” Vulture.com. September 12, 2016. Art history is so self-referential, so compulsively exclusionary that it has exhausted itself of any meaningful sense of vivacity or value. Saltz writes that art history is “dead already; it just doesn’t know it. […][Our art history] is Zombie Art History.”11Saltz. Saltz calls out this sort of zombified academicism as a stiffened ideology both idiotic and imaginary, as a species of intellectual fundamentalism beneficial only to its practitioners, and no one else. It might be easy to dismiss Saltz’s cri du coeur as an anti-academic polemic, except that the academicians, art history’s practitioners themselves, also have trouble defending the discipline as actually relevant. Collecting is cyclical, repetitive, human behavior. Repetition is at The Keeper’s core — each separate project relies on repetition’s peculiar power. In Hendeles’ Partners (The Teddy Bear Project) 2002, for example, the image of children and their teddy bears repeats and echoes three thousand times. Vanda Vieira-Schmidt’s ongoing Weltrettungsprojekt (World Rescue Project) is comprised of hundreds of thousands of her drawings, at times produced at a rate of hundreds per day, are meant as a means of producing a positive counterforce to demonic forces in the world. Ye Jinglu commemorated each year of his life, from 1907 until he died in 1968, with a visit to a photographer’s studio. The resulting portraits, lined up like signal flags, spell out the story of one man’s time-travel. There is a certain sense of melancholy that accompanies these photographs as we see Ye Jinglu’s maturation slowly slide into aging, and the implication of his project’s sudden end. Just as [the Greeks] taught all knowledge is recollection, thus will modern philosophy teach that life itself is repetition. […] Repetition and recollection are the same movement, just in opposite directions, because what is recollected has already been and is thus repeated backwards, whereas genuine repetition is recollected forwards. Repetition, if it is possible, thus makes a person happy, while recollection makes him unhappy[…] He who wills repetition, he is a man, and the more emphatically he has endeavored to understand what this means, the deeper he is a human being. But he who does not grasp that life is repetition and that this is the beauty of life, he has condemned himself [to death.] He who chooses repetition, he lives.12Kierkegaard, Søren. Repetition and Philosophical Crumbs. Oxford University Press. 2009. 5-6. Harry Smith. String Figure. n.d.
Kierkegaard’s apparent paradox — re-collecting forwards — in the end, is the engine of The Keeper. Each project chooses, emphatically, repetition, as each one is pulled by melancholy, nostalgia and recollection. Each project operates, in its own individual way, along Kierkegaard’s eternal piston movement between melancholy and joy. 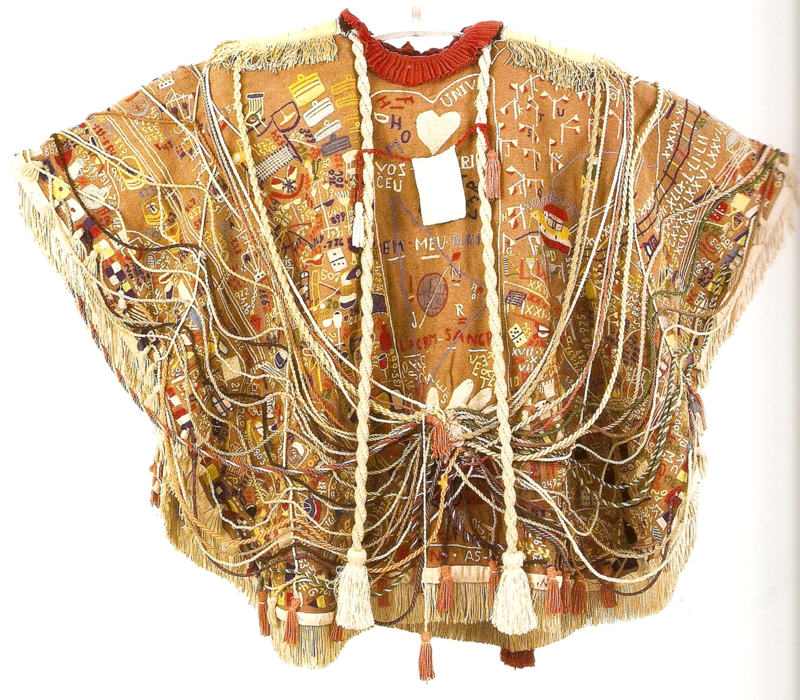 The exhibition includes a selection of string figures collected by Harry Smith (1923-1991), eminent shaman and famous collector of songs. In them he saw a universal, non-verbal language, but they could also serve as talismans for the the exhibition itself. Each one takes the simplest symbol for eternal cycle, a loop of string, and bends and weaves and knots it into more meaning, and then repeats that transformative magic over and over again. Human hands transform the material — first into the infinite loop and then into something else. Each figure is unique, and each figure is the same, individual and universal in microcosm, in continuous repetition. Like the string figures, each project in The Keeper weaves the base material world into something marvelous. A lesson regarding art history lies here as well. Art history, as Saltz observes, sees its world linearly. Art history knows its problems are knotty, like a string figure. But rather than find meaning in the figure, art history seeks to undo the knot, pull out the weaving, and straighten the intricate loop into a single line. Then, and only then, can the discipline do its work. Art history can’t do what it does without a beginning and an end, a single line of inquiry, and a rigorous disregard of the marvelous. 1. ↑ Borges, Jorge Luis. “John Wilkin’s Analytical Language (1942)” in Selected Non-Fictions. Eliot Weinberger, ed. New York: Penguin, 1999. 229-232. This is the passage that set Michel Foucault on the path to write The Order of Things. 3. ↑ Gioni, Massimiliano. “The Country of Last Things” in The Keeper, M. Gioni and N. Bell, eds. New York: New Museum, 2016. 10. 5. ↑ I suspect it is the same black chaos that gnaws at the edges of Andrzej Stasiuk’s Tales of Galicia, a book of similar time and place as Rydet’s photographs. 6. ↑ A lovely tote emblazoned with a quote by Zofia Rydet, “Dzień w kotórym nie fotografuję, uważam za stracony.” (A day in which I don’t photograph is a day I consider lost.) is available from the Fundacja Sztuk Wizualnych (Foundation for Visual Arts) here. 7. ↑ Wallis, Brian. “The Keeper.” Artforum. October, 2016. 271. 8. ↑ The anxiety this strategic contrast creates in some culture-builders is evident in the language of pathology — “hoarding,” “mania,” “compulsion,” “creep factor,” “weirdo,” — that leaks into some reviews. 9. ↑ Some 43 years ago, art historian Linda Nochlin describes the endless antagonism between the various incarnations of R/realisms and abstraction, as she sees it, in the art historical mode of high moralism. Indeed, the essay is entitled The Realist Criminal and the Abstract Law. In it, she describes the same contradictory forces at work in painting. She writes, “Whereas the nonrealist may work through distillation and exclusion, the realist mode implies enrichment and inclusion.” This is seen as R/realism’s fatal flaw, inclusion is a “lack of selectivity,” a sort of promiscuity which in turn leads to a existential “irrelevance.” She writes, “Irrelevance is indeed a prime feature of the intractable thereness of things as they are and as we experience them.” The Keeper presents an catalog of thousands of counterarguments to this fundamental art historical assumption — some objects, art history insists, because it has to, are better than others. 10. ↑ Saltz, Jerry. “The Tyranny of Art History in Contemporary Art.” Vulture.com. September 12, 2016. 12. ↑ Kierkegaard, Søren. Repetition and Philosophical Crumbs. Oxford University Press. 2009. 5-6. © 2019 Delirium Studies. All rights reserved.